The proliferation of 4K ultra high-definition broadcasting and the promise of 8K resolution coming soon are increasing demand for broadcasters to move to high-bandwidth fiber optic cabling solutions. To meet those demands, Optical Cable Corporation (OCC) is introducing a new line of SMPTE cables and enclosures that are designed to address a wide variety of user needs. Whether in permanent installations or challenging deployable applications, the effective selection and installation of broadcast cables and connections can involve an assortment of requirements. Among these high-bandwidth, low-signal-loss cables designs are highly flexible cables that enable quick and frequent camera movement, riser/plenum versions for permanent installations, and 3-in-1 SMPTE compatible cables to transport three cameras’ signals in one location with only a single cable run. 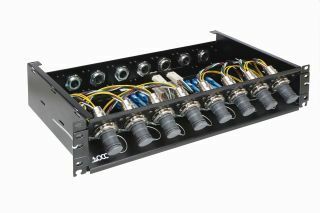 The new OCC line also includes a selection of modular enclosures specifically designed for SMPTE 304 or other commonly used broadcast connections. These advanced designs include full fiber management, integrated splicing capabilities, all include within the enclosure. Models support up to eight ports on the front and back, as well as the ability to accommodate the three-channel stadium cable. All are designed to be mounted in standard 19-inch racks without requiring extra space above or below. Additionally, mobile production trucks, with repeating deploy-and-retrieve operations for sporting events, require a ruggedized tactical cable that will last. OCC recently introduced the Migration Control Technology to address the migration challenge experienced in the broadcast Industry, resulting is extended life of the assemblies and reducing repair costs. This new broadcast offering is an extension of OCC’s long history as a leader in providing high-performance fiber optic and connectivity solutions for enterprise and harsh environment communications.